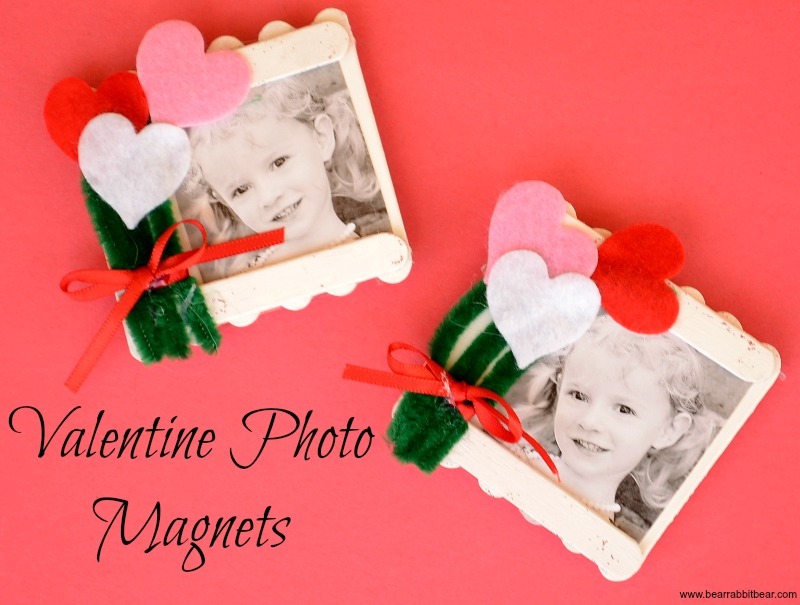 I recently came across this Valentine Photo idea in a Oriental Trading catalog. I liked the concept, but didn’t really need to order a package of 12. And, of course, I can make my own, right? 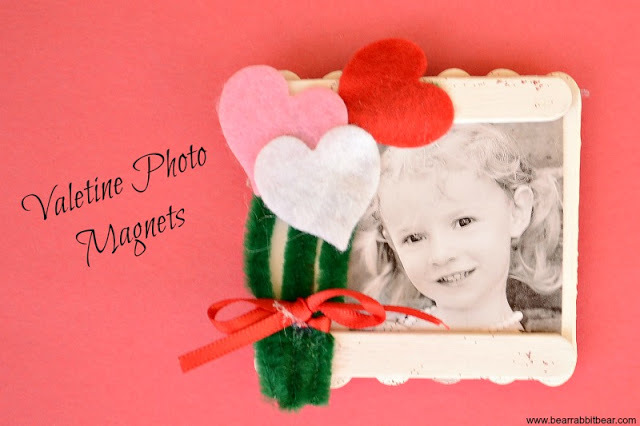 I made mine into magnets and used items that I had around the house. My little one had fun making them. 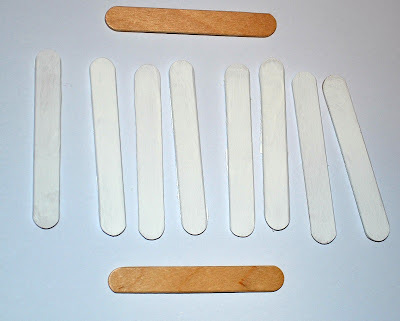 Wooden craft sticks– 10 per craft- I used the mini size from Craftprojectideas.com. The regular size can also be used. Green Pipe Cleaners/fuzzy sticks– I used the large size from craftprojectideas.com and cut them down. 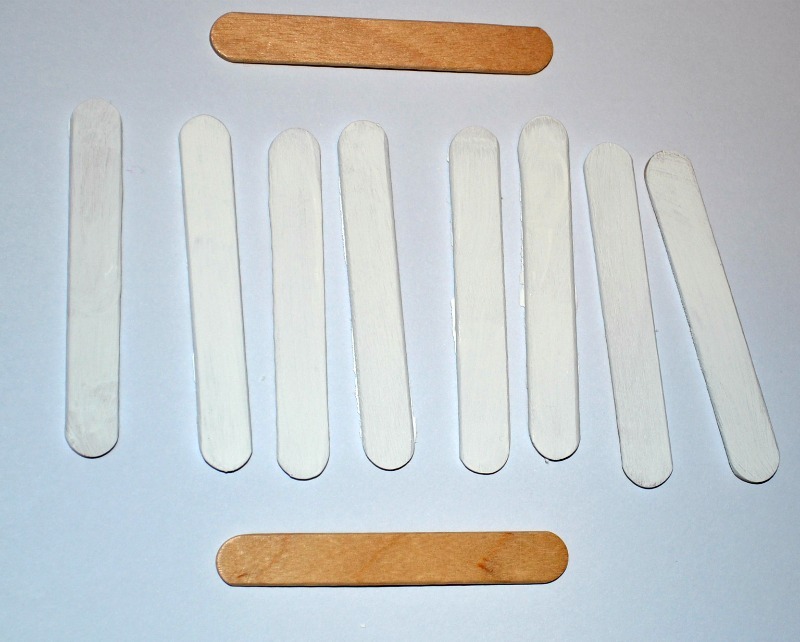 Begin by painting eight craft sticks white. Let them dry. Use hot glue to attach the eight craft sticks to two unpainted craft sticks. Cut the photo to the desired size. It needs to be off-centered to the right. Make sure there are visible white stick ends above and below the photo. Hot glue the photo to the sticks. 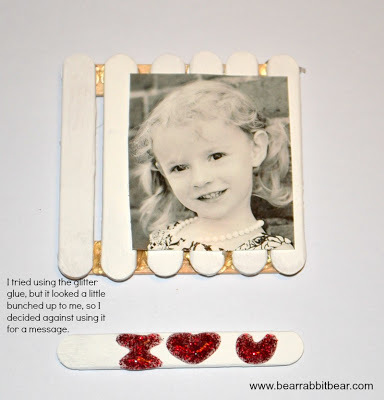 If you want to use the red glitter glue to write a message on one of the remaining painted craft sticks, now is the time to do it. Let the glitter glue dry. 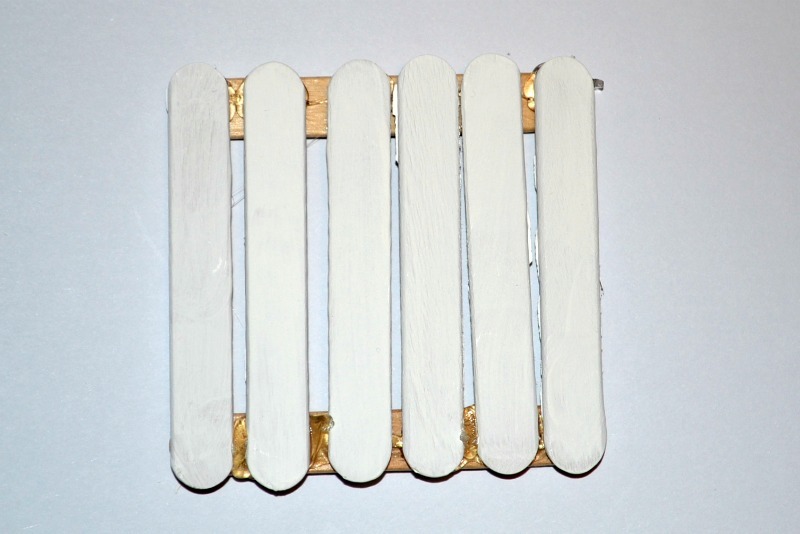 Glue the remaining two white craft sticks to the craft. One should go horizontally across the top of the craft, and one should go across the bottom. Use the sticks to cover up any rough cut edges of the photo. Now cut the green fuzzy sticks. The sizes will depend on the size craft stick that you are using. I cut three green fuzzy stick lengths. One was about an inch, one an inch and a half, and one about two inches. Hot glue these to the left side of the craft. Play around with this step to make sure that they are not covering the photo. Stick the felt heart shapes to the tops of the fuzzy sticks. 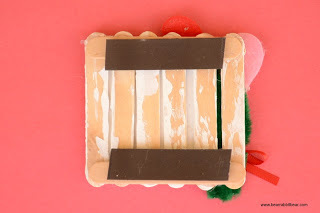 Use hot glue to secure them if desired. Attach magnet pieces to the back of the craft. 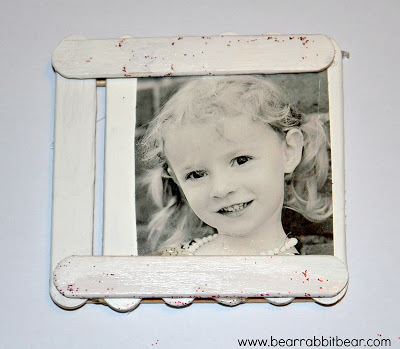 Give as a gift to grandparents or others! 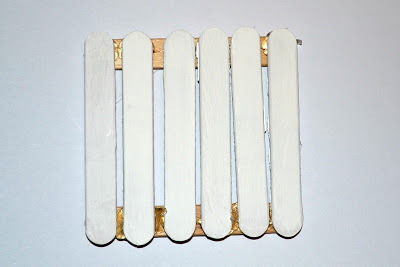 Disclosure: I used free product from Craftprojectideas.com for this project. All opinions are my own. Such a cute idea! I want to save this for little gifts next year! This is such a cute idea! I love how they turned out.